Yeah, but this doesn't say that Mantle's homer couldn't have been a 500-footer, which again would still be a prodigious shot. It says it wasn't 565, which I completely agree with, that figure is bull. And I think the wind needs to be taken into consideration when discussing this homer. Last edited by PRW; 04-26-2017, 09:26 AM. Any home run where the primary source is someone trying to retrace where they picked up a ball I take with a grain of salt. I am sure Mantle and Ruth both hit 500 foot home runs. I am sure Ruth probably hit more than anyone else. But anything over 550 (especially those completely absurd 700+ footers) I think are just tall tales or simply overestimations. Those HR's were probably bombs, but they were still men with limitations. "Batting stats and pitching stats do not indicate the quality of play, merely which part of that struggle is dominant at the moment." If he did, it was a dumb move. The odds of McCovey getting an XBH—about .100 when they played together--would be much lower than the odds of the player following him getting at least a single. A little bit off topic, but.... I'm sure Mantle's blast in- I think- 53- was prodigious, and probably travelled 500 feet on the fly, which is amazing. In 1960 or 1961- I can't remember for sure- the Dodgers were in Pittsburgh for a night game. I was listening to the game on the radio. I'm not sure, but I think it was the first inning. Frank Howard hit a titanic shot over the scoreboard at Forbes Field. Bob Prince went apopleptic,calling it the most amazing thing he'd ever seen. Then, an inning or two later, something remarkable happened. Joe Tucker, the long time Steelers announcer, was coming to the game and arrived a few minutes late. He was walking through Schenley Park, beyond left field, when he heard a roar, then saw a baseball hurtling way over the scoreboard and landing near him. He must have realized what had happened and marked the spot where he saw the ball land. He actually came up to the radio booth and talked to Prince about it during the game. Later that night or the next day they did a measurement and found that Howard's drive had gone 535 or 538 or 540 feet on the fly. I can't remember precisely, this was 56 or 57 years ago. Anyhow, I think this has quite a bit of credibility, and probably is one of the longest "authenticated" homers ever. Maybe someone with more advanced internet research skills than I can find something online about this. Did Mays hit any 565 ft homers? The 565 ft home run never happened. It's been debunked. I'm more impressed with Mays playing professional baseball while still in high school. Did Mantle have more raw ability? Willie played professional baseball at age 16, mostly due to his off-the-charts raw ability. In terms of raw power and speed? I would say so. Mantle supposedly hit more tape measure home runs, and from what I have heard his times to first were faster. I would take Mantle in terms of stop watch speed, but Mays was a better baserunner and took better routes to the ball. Mantle supposedly hit a 565 footer. That would have been something to see. Was it hyperbole? Maybe so, but Mantle just might have been the king of the tape measure shots. Last edited by dl4060; 04-26-2017, 09:17 PM. I can't imagine Mays actually doing this it's preposterous. I've heard of "Ruthian HR's" never "Mantlian HR's". Great points that aren't taken into seriously consideration around here by most posters... despite the continuous efforts of many of us. Last edited by bluesky5; 04-27-2017, 07:42 PM. I've heard of "Ruthian HR's" never "Mantlian HR's".. I've actually heard of more legendary tape measure shots from Mantle than Ruth. 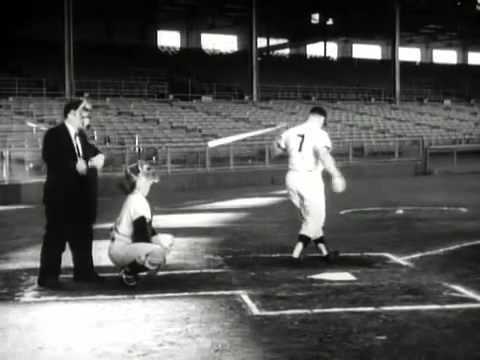 Mantle came closer to hitting one out of old Yankee Stadium than anyone else. Legend has it the ball was still going up when it hit the facade....I think that might be pushing it, but it is still the stuff of legend. EDIT whoops I see this has been mentioned before. Okay: He also allegedly hit a ball that allegedly would have traveled an alleged 734 feet, if it hadn't bounced off the top of the roof over the third deck in right field at the Stadium. Last edited by westsidegrounds; 04-28-2017, 07:25 PM. While they were certainly dominant, look closely at the standings from that period. The Yankees from 49 through 55 typically won by only a few games. They had competitors, they were just a few games better than the other teams each year. There is a big difference between winning by 4 games every year and winning by 10 games every year. Both are impressive, but if you win by 4 games you have other teams that are competitive, so it is not necessarily a situation where one team is far superior to the others. Now from 56 through 64 things were different. During those years they tended to win by 8 to 10 games which indicates a much higher level of dominance. I don't think it is fair to say the AL was not at all competitive from 49 to 55, other teams certainly had the chance to win, they just were not quite able to do it. The late 50's early 60's Yankees were much more dominant than the 49 to 55 period, they typically won by much larger margins indicating they did not have competitors. I'm not saying the AL from 49 through 55 was necessarily as competitive as the NL, I don't think it was, I'm just saying that during the first half of the 50's the Yanks DID have teams that were competitive. I don't think simply listing the teams which win is a way to really get a picture of how competitive a league was during a period. It does not differentiate between teams that win by 10 games and teams that win by 1 game. I don't think it is really fair to say the Yankees had not competition from 49 to 55, they did. From 56 to 64 I don't think other teams were as close. Did the Yankees dominate the AL from 49 through 55? Yes. But they did have some competition during that period. And while I think the NL had more good teams during that period, that does not necessarily mean the second tier teams in the AL were below the second tier teams in the NL. Had the Yankees been in the National League they might well have won about the same number of pennants. I don't think the fact that the Yankees came in first so much means the AL was weaker than the NL in and of itself. I do think the NL was stronger, but for other reasons. I'd have to do some research to get exact totals, but from looking at old Sporting News guides ... I've accumulated quite a collection ... the Yankees M.O. seemed to be that they'd beat the snot out of the weak sisters, and then would win the series with the teams that were competitive with them like 12-10, 13-9, etc. Stengel's first four teams won by 1, 3, 5 and 2 games, and in '55 they won by 3, so they were tested. They just seemed to get it done when they had to get it done. Mantle created 1 run for every 3.042 outs made. While Mays did create more runs over his career, it took him a greater number of outs than Mantle to create 1 run. In other words, it will take Mays 84.8 outs to create 25 runs, Mantle would take 76.05 outs to create the same 25 runs. The AL was not necessary a weaker league. Looking at the yearly numbers in the 50s and 60s, there were about equal time periods where both AL pitching was better as well as when NL was better. Remember that players face a team of pitchers. Having a few dominant pitchers may make the league look stronger, but there are also ones below average that players face as well. Sometimes AL teams dominated the pitching numbers having more teams than the NL in runs allowed. At other times vice versa. It was about equal during this time period. Mantle never faced Yankee pitching, well Mays never had to face Juan Marichal. Having McCovey bat behind him protected Mays so he saw better pitches. Mays played his first few seasons at Polo Grounds IV, which had a center field depth of 480 ft. He played most of his career at Candlestick Park that had a depth of 420 or 410 ft at the time. Mantle played in Yankee stadium where center field was between 461-463 ft. (I do agree that Mays was the better fielder though) Remember that Mantle's knee injury in the 51 WS -his rookie season- would haunt him for the rest of his career. This thought of course does not take into consideration the rest of the outfielders playing and the area of responsibility for each. Mantle's MVP numbers in 1962 was based on 123 games played and 502 PA, he still led the league in BBs, OBP, OPS, OPS+. Mays did have 90 XBH on 702PA. Both the Giants and Yankees finished in first that year. But don't think the AL was the weaker league because of this. Maury Wills won the MVP for the NL that year and his numbers were not even near Mays. This was not the case of the NL MVP winner having better numbers, it was simply a bad choice by the league. Last edited by morpheus1776; 06-11-2017, 09:06 PM.